Kirkland diapers offer all around stretch, hypo-allergenic, super absorbency all at a low and affordable price. Also latex free with super soft cotton inside and out, as well as contoured shaping for active babies. Do you shop at Costco? Ever buy their diapers? We'd love to hear what you have to say about them. We'd love it if you used our 5 star rating system to rate your overall opinion of this brand of diapers. Even better if you could include our rating system by adding your score of 1 - 5 for the following categories - absorbency, comfort, durability, price, and availability. To leave your review simply click where it says "click here to post comments". I am so disappointed from Kirkland diapers even I only get kirkland wipes... but the diapers are too expensive with very bad quality. I have tried generic and brand names and honestly, those diapers are very similar to the Walmart brand... I am returning them. 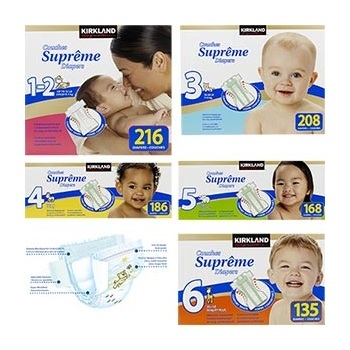 My daughter is a year old and we have primarily used Kirkland Signature Supreme Diapers from Costco. They were originally recommended to us by my sister-in-law who swears by them. We've experienced very few blow-outs with these diapers and I really like the way they fit without giving my daughter a "saggy bum" look. They're also a bit longer than other brands we've tried and fit our taller baby well. They're inexpensive when compared to name brand diapers and I like that I can get a big box that lasts a long time. Return to Baby Diaper Reviews.